This corded necklace is made using a nylon and spandex cording that looks like suede. The length can vary from about 17 to 20 inches with a center jeweled piece that adds 4 inches. It is done in royal blue and mint green. The jeweled piece starts with a large green twisted glass octagon that is surrounded by blue seeds and small mint green bicone crystals. 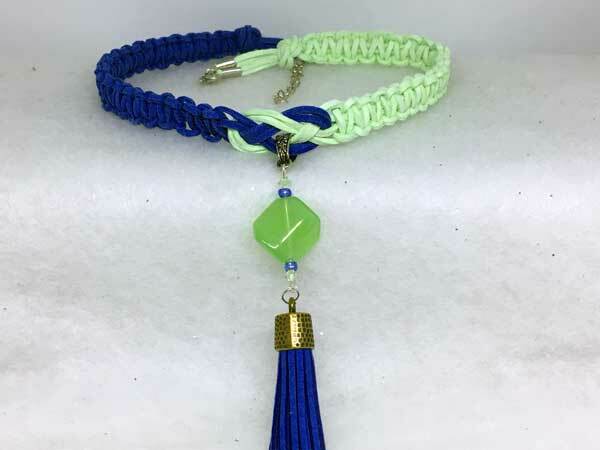 Hanging separately from this is a royal blue tassel that coordinates perfectly.